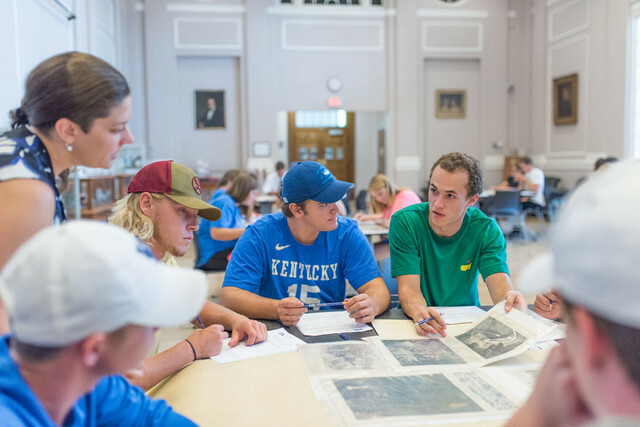 The Special Collections Research Center supports the teaching mission of the University of Kentucky by providing a diverse range of instructional activities which make use of archival collections, rare books, and oral histories. We work directly with undergraduate and graduate classes to introduce primary resources for research and experiential learning assignments. Please visit the SCRC Instruction Request page in order to arrange for a class session. All class requests must be submitted through the online form. If you have additional questions, please contact Matthew Strandmark, Education Archivist. Please make your reservation at least two to three weeks in advance - allow more lead time if a new activity or customized teaching support is requested. Special Collections faculty and staff speak to your class, we can arrange for a variety of presentations, from a ten-minute introduction to a full class session. We can lead exercises devoted to our holdings in a specific subject area, lead introductory sessions on primary sources, and provide general overviews on a variety of topics. Special Collections staff members can help you locate materials to support your teaching. We have extensive knowledge of our collections, so please don’t hesitate to contact us for suggestions. Special Collections staff members can provide an overview of Breckinridge Research Room procedures, from a tour of the room to instruction on how to request material. We have tables large enough to accommodate small groups of faculty and students (2-8 people) conducting collaborative research, as well as individual researchers. Faculty are also welcome to teach in Special Collections. We can provide the materials and space you need and leave you with your students. Special Collections staff are happy to collaborate with faculty to craft assignments based on the collections. Consulting with Special Collections staff in advance will help us work with you to prepare for student needs. We have samples of previous exercises available for your consideration. All class sessions are assessed; we will work with you to ensure your students complete the assessment. The guidelines that apply to the Breckinridge Research Room also apply to the Great Hall, the Ford Center, or any classroom space where archival materials are present. Please distribute these guidelines to your students before class. A Special Collections staff member will be present to greet your class. Visitors must use pencil only (we have an ample supply). In the Great Hall, please store bags, food and beverages, and other personal belongings away from the work space. Students and faculty are welcome to bring notebooks, secondary sources, laptop computers, tablets, and cell phones for use in the activity. Student can take photos of the materials as a research-copy only, if permitted; no flash photography. Suitable for larger classes or group work – 16 modular tables arranged in up to 8 group stations with 6 chairs each (48 seats), available in various configurations. A projector and screen are available; media cart with TV monitor, VHS player, and multi-region DVD deck. Modular tables, internet, large screen, and TV with HDMI computer connection.